This report is one chapter in a longer series that chronicles a multiday car-camping and mountaineering expedition, done in the summer of 2016. This report is for Day Three, July 17th. We hiked Peak 5769 and several other numbered bumps (read Day 1, Day 2). I came to call this day The day that couldn’t make up its mind — we had blazing sun, heavy rain, wind, more sun, low cloud, sun again, hard rain, lightning, and finally sun as we descended back to the car. some weather rolling in again. 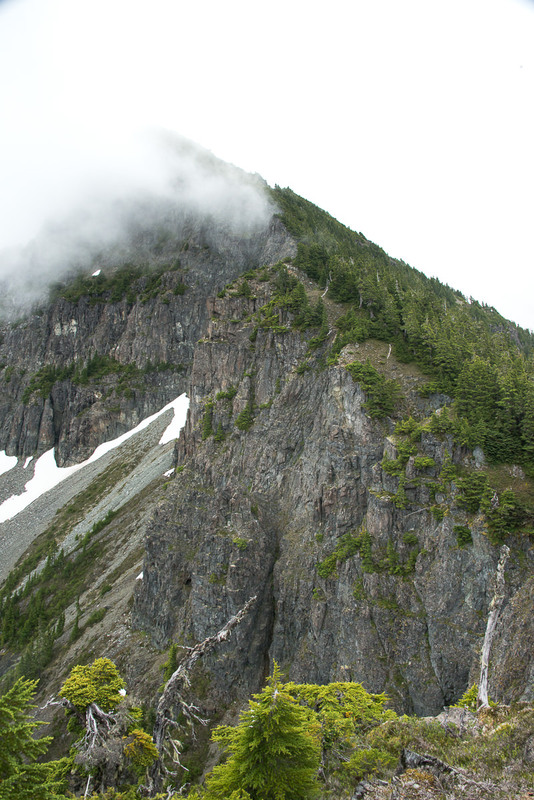 Every summer, I plan multiday adventures on Vancouver Island. I often find myself trekking along the coasts, mountaineering through the backcountry, or paddling the rugged west coast. These trips become the focus of my summer, around which everything else is planned. Arranging for our group members to have the same days off is usually one of the biggest planning issues. So, when we finally get our schedules coordinated, these days become sacrosanct. This summer, we planned a trip through Strathcona Park along the Wolfe/Cervus Divide — but Mother Nature had other plans. As our planned trip approached, the forecast turned to three days of lightning and rain. 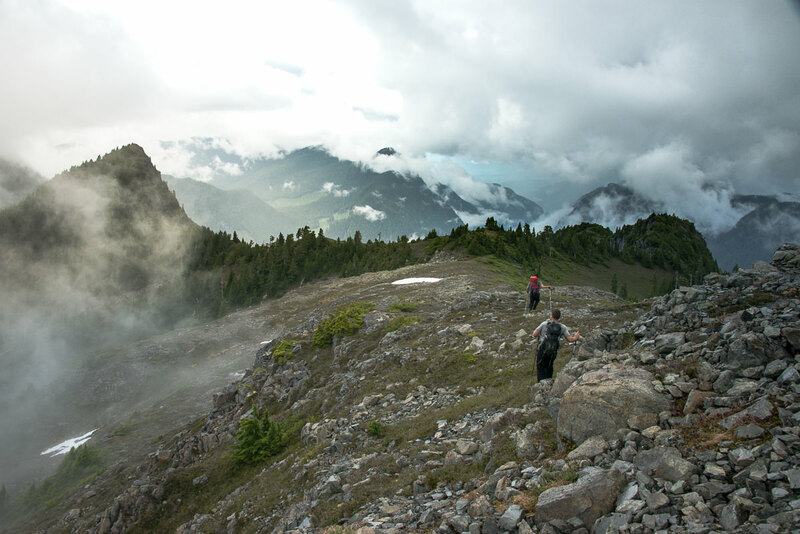 We reconnoitred and decided to travel beyond the weather, finding adventure in the Bonanza Range. I woke to the familiar sound of rain pattering on my tent. Phil was already up, shuffling around as he struck camp. It wasn’t even 5:00 am yet, still pre-dawn, but he was eager to get on the road so we could summit Peak 5769– I know I was. The approach followed two different logging spurs off the Kokish Main. After exploring an overgrown, alder-filled road, we left the Jeep parked midway up a steep hill and started our hike. We started quickly, and as we walked, I turned my head back to the Jeep to familiarize myself with the terrain. I was startled for a moment– only the top of the Jeep was visible through the dense patch of alder. We reached the end of the road within ten minutes, and set a course according to the topo maps, aiming for a saddle a few hundred meters above the road. 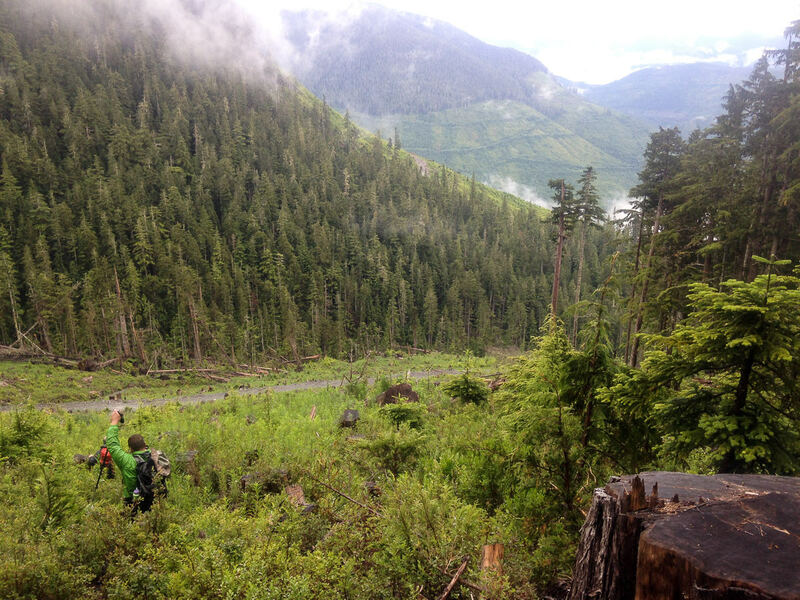 We cut through a short section of not-too-bad logging slash and entered the first-growth (~1160m). The evening rain hung heavy on the plants; blueberry and azalea branches drooped under the weight of the water, and droplets formed tiny globes on the needles of evergreens. After only a few steps into the bush, my pants were soaked; water streamed down my legs, under the gaiter and into my boots. By the time we forged through the moderate bush to the saddle, my boots were swimming pools of water. The normal crunch of tinder under my foot was accompanied by the sound of water squishing out of the boot. As we moved between the alpine timber, the sun broke through the clouds. Blazing sun dried our jackets and created a beautiful spectacle as the light passed through the trees and cloud. 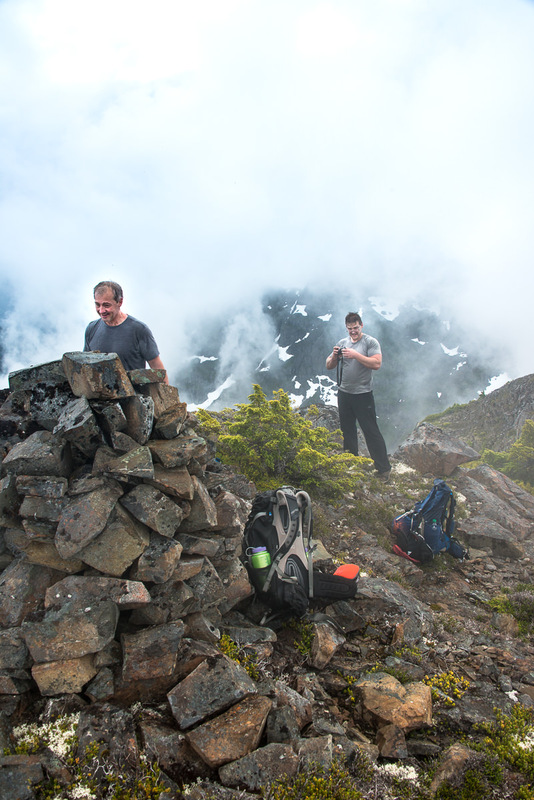 We had multiple objectives for the day, all rising off the long ridge that forms the Bonanza Range, and once at the saddle (1350m), we selected the closer of the two objectives — Peak 5769 — as the first goal. We headed east, following the crest of the ridge as it gained elevation to Peak 1515. More of a viewpoint than an objective, we stood at the dramatic drop-off and admired the route ahead despite the low-hanging cloud. We didn’t linger long, but tried to hurry; nevertheless, the niggly terrain slowed us. 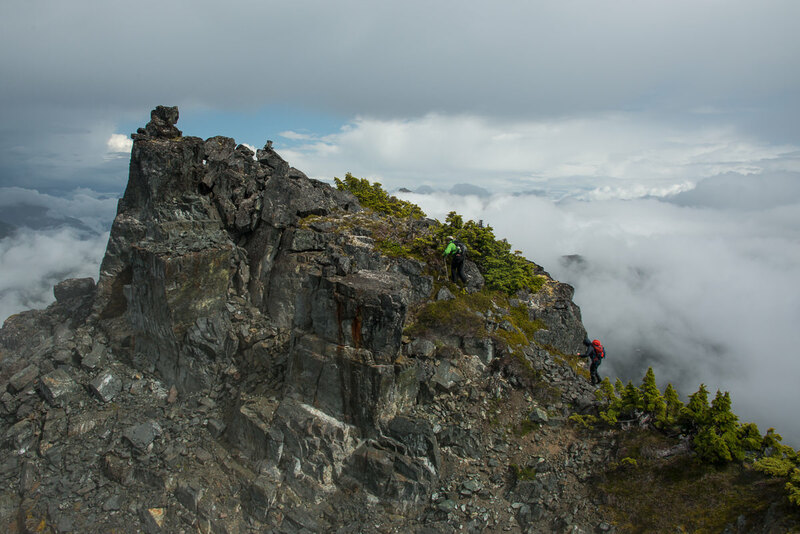 We scrambled down rock and shimmied around wet, stunted shrubs as we lowered ourselves to the easier terrain below. With the benefit of hindsight, if you’re interested in hitting up Peak 5769, use our return route; it avoids the unnecessary elevation gain/loss and scrambling, and is much faster. The effort of the downclimb caused perspiration to form on my brow. It must have been some sort of special bug attractant, because they swarmed to me when I stopped to wait for the rest of the group. I didn’t pause long – aiming to outrun the bugs, I hustled along the ridge to the southeast and dropped off the ridge along a long, gentle slope. The grade was easy, but the terrain was made up of talus hidden below a heavy layer of moss and heather. We relied on our poles to keep us from losing our footing over the uneven, slippery terrain. Soon we stood on the precipice of another extreme drop-off, this time into the Catherine Creek Valley. Our objective was still about a kilometer to the east, and we crept along the edge of the cliff until it merged with the summit massif and gained elevation. just follow the cliff edge up to the summit; or, avoid the bush all together and trend to the right. Brutal. Yes, that’s the word that best describes this short section. 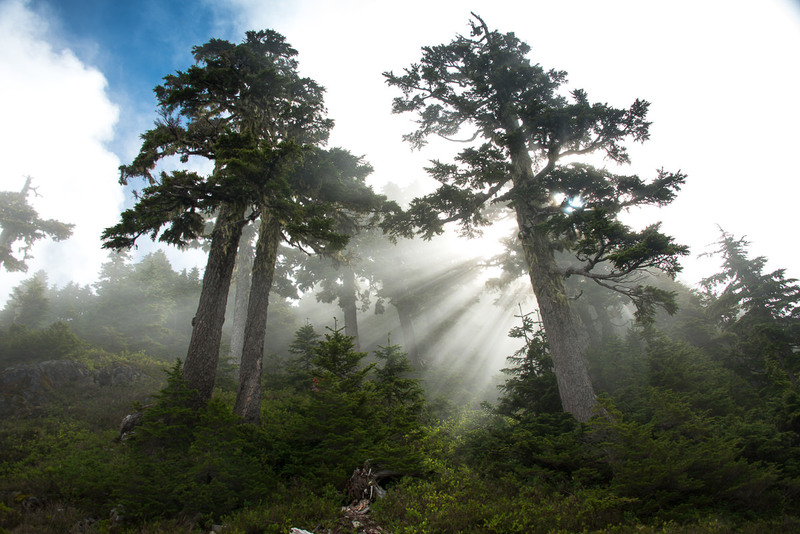 The bush is an intense mat of stunted, tangled alpine fir that rises just above the eyeline. I couldn’t see anything beyond what was immediately in front of us. In many places, I used the full force of force of my body to push through the thick branches. In other places, it was easier to crawl on all fours below the branches (later, I would shake two cups’ worth of dry needles from my backpack). I had flashbacks of the trip up Mackenzie Peak, when Phil let go of a branch and it hit me square in the face — that snapped me back to the moment. At one point, we emerged into a 10′-x-10′ clearing in the middle of the ghastly stuff! We dropped our poles, and I packed my camera inside my backpack before pushing through the second half. It took us more than forty-five minutes to gain less than 300 metres over just under a kilometer. The going was slow, but we eventually emerged onto Peak 5769’s treeless summit. The cool air struck me and I inhaled deeply — sweet freedom! 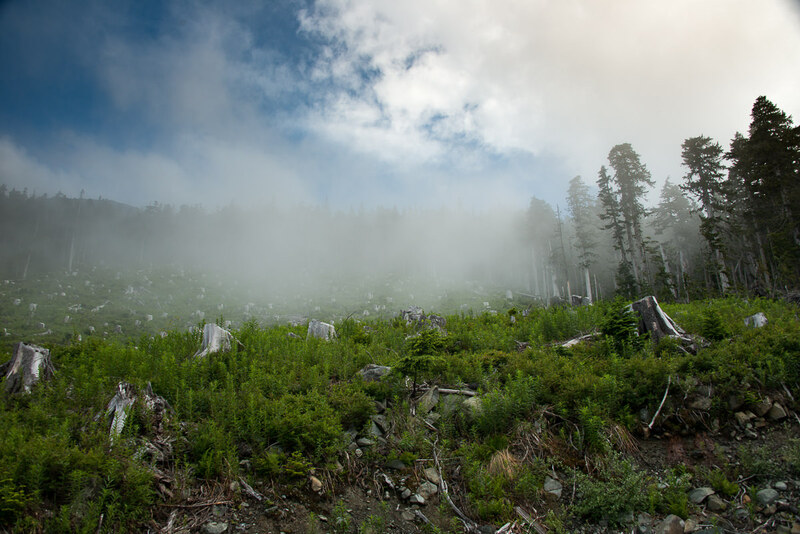 During our time in the trees, a fog rolled in, but as we ate our snack on the summit the clouds parted for a brief moment, long enough for us to see Bonanza Peak and Mount Ashwood (the peaks from our first day of adventure in the Bonanza Range). We took our cue to leave as the clouds rolled back in. As we started our descent, we noticed a ramp right before the trees started. Since we had nothing to lose but time, we gave the route a shot. Boy, was it worth it! We descended quickly down the treeless slope and stopped when we were parallel with our poles. Walking to the bush, we prepared ourselves to fight through it to get our poles. We pushed at the first tree, and it parted to reveal the clearing — right there! Many groans were uttered. We couldn’t believe it was right there all along! We grabbed the poles and broke back to the clear slope, which we followed all the way back down to our original route. What had taken us an hour to ascend took only fifteen minutes to descend. We walked our route back to the ridge in the fog. Instead of following our scramble route, we detoured in the opposite direction, following another ridge line. A moderate rain started and followed us as we plodded along the ridge. 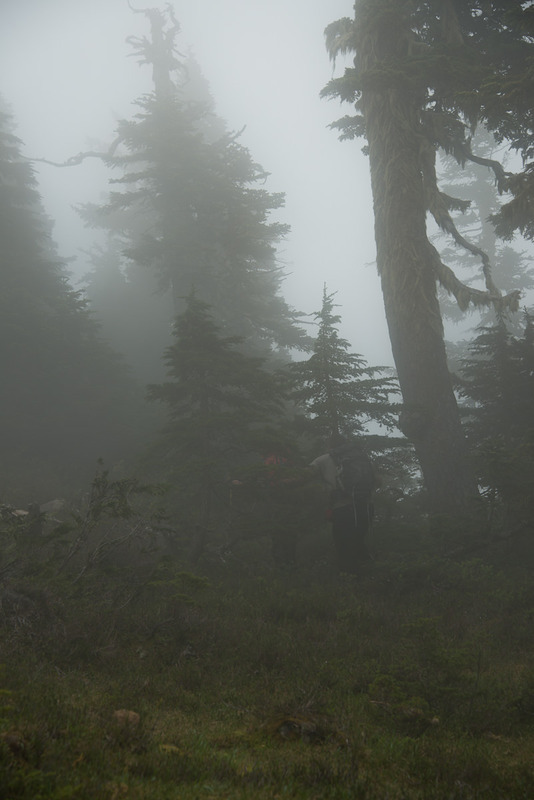 Visibility was crap, so we planned our route by looking at our topo maps. We arrived on another high point and found a small cairn, but soon left it behind and headed back toward our approach route over Peak 1515. Rather than going high over the massif, we stayed well to the left (south) and avoided the scramble and elevation gain; instead, we routed around it through the bush and eventually regained the ridge. By the time we arrived back at the first saddle and started toward our second objective, the rain was pouring down. As we gained elevation, we scrambled over the grippy rock, using a variety of rock ledges to gain the top of a wide flat-topped ridge. Rick wasn’t immediately with us; he opted for a different route, and we couldn’t find him in the fog. It took a few minutes of calling out before we finally heard his voice, barely a din through the dense fog. When he finally appeared, he arrived with a boom as thunder rolled in the distance. We all held our breath, waiting silently to hear the next crack. When it came, we couldn’t see the expected flash. We decided that we shouldn’t risk it: it was time to change the route and head home. There was no way I was scrambling down the route we climbed. I was convinced that there must be an easier route down! We took long enough in our search that eventually the rain abated, and the thunder subsided. The sun started shining, and when the cloud broke we spotted one last bump to explore. A final unarmed bump for the day. As it turns out, there are two bumps very close together (on the map they share a contour line). While I scrambled the westernmost bump, Rick and Phil climbed the east. When I was on top, a wind gusted in; a moment later, the cloud was gone. In the absence of the mist, the ridge we were hoping to hike was revealed. In the video you can hear Phil’s reaction when the wind blows off the clouds. The ridge is jagged compared to what we had already crossed, but it had to wait for the next day. On our return to the Jeep, we followed a different route. It took only a little luck and some good navigation to find a Class-two hiking route that avoided the scrambling we did on our approach to the final objective. Rick masterfully rowed his way through the bushes; I barely managed to keep pace; and Phil brought up the rear in a cascade of curses brought on by slips on the steep, wet heather. His shoes had reached the end of their life — no grip! We ended the day back at Bonanza Lake. As we set up camp and ate meals, we made a route plan for the next day, including finding the approach route that would allow us to access the ridge we spotted today.